NVIDIA or AMD Video Card? What’s the Difference? An important part of any performance PC is the Graphics Processing Unit (or GPU, the brain of the graphics card), but the GPU is especially important when it comes to gaming. The GPU is responsible for processing the visual data that is seen on the monitor. Many CPUs come with integrated GPUs, but these are much less powerful than the GPUs in dedicated video cards. For gaming, you want a video card. There are three primary GPU manufacturers: AMD, Intel and NVIDIA. Intel has by far the largest marketshare (more than 60%), but Intel’s GPUs are integrated and are not powerful enough for gaming smoothly. For gaming, you’ll want a card from AMD or NVIDIA. Both AMD and NVIDIA have been making video cards for years and have constantly been pushing the boundaries of GPU technology. While there are advantages and disadvantages for both brands, it helps to understand how GPUs work before deciding which one is best for your system. As previously mentioned, a GPU is responsible for processing all of the visual data that you see on a monitor. The GPU needs to decide how to use each of the 2 million or so pixels on a typical monitor in order to create an image. It does this by using geometry, texture and lighting data to come up with color values for each pixel, painting a 2D image of the 3D data. Under typical conditions, a good video card is capable of doing this 60 times a second! When it comes to comparing video cards, it’s hard to tell who the clear winner is. Both AMD and NVIDIA have the same end-goal in mind: Deliver smooth and fast visual performance. However, each company takes a different approach to achieving that goal. Unlike CPUs, which typically have between 1 and 8 cores, GPUs come with a lot of smaller cores called “stream processors.” While each of these stream processors doesn’t have near as much computing performance as a CPU core, they work together to process visual data much more efficiently, allowing for significantly improved graphical performance. Not all stream processors are alike. NVIDIA takes the approach of creating fewer, more capable stream processors, allowing for slightly more complex calculations. This makes NVIDIA cards excel not only at gaming, but also at many other data processing applications, such as complex finance and informatics. AMD takes a different approach by creating smaller, less complex stream processors. Though the processors are not as capable, the difference is made up by quantity. Because they have a lot of smaller processors that can handle simple calculations, they particularly excel in tasks such as cryptocurrency mining, which requires simple calculations to be performed many times. When it comes to choosing between the two, you need to see what your main priority is. 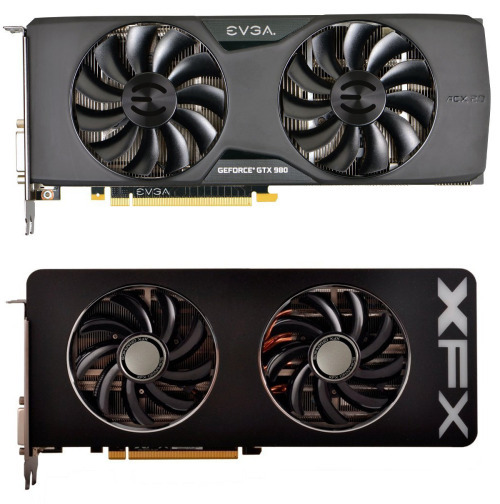 For gaming, the two companies often trade the crown for best performing GPU and often offer cards that perform similarly at several price points. It’s best to read the reviews of each card you are considering purchasing. AMD will do better with some games, and with very high resolution monitors. NVIDIA will do better with other games. Similarly, for non-gaming tasks, you’ll want to check benchmarks to see which type does better. The differences in GPU architecture can have significant performance implications. Many applications only support specific architectures, limiting choices to a single brand or even a single line of cards within that brand. If you are planning on gaming, there are tons of resources and benchmarks that will compare both NVIDIA and AMD cards in real word gaming situations, such as Anandtech’s Bench. Benchmarks for the specific game you’re interested in are ideal, if those aren’t available look at benchmarks for a variety of games with similar graphics. For a good overview of how most cards perform for gaming, check out this gaming GPU hierarchy. When considering system compatibility, one frequently asked question is “can an AMD/NVIDIA card work with an Intel/AMD processor?” Fortunately, it doesn’t matter what processor you have. An AMD video card will work well with Intel and AMD processors, and an NVIDIA card will do the same. However, there are a few considerations for those who plan on utilizing AMD’s Crossfire or NVIDIA’s SLI features. Crossfire and SLI allow you to use more than one GPU at the same time, which often dramatically increases video performance in games that can utilize SLI or Crossfire. In such games, adding a second card may yield anywhere between 70-90 percent improved performance. But be wary if the game you are playing does not support SLI or Crossfire, as you won’t get any benefit at all from your second card. One consideration about AMD: Though both AMD and NVIDIA cards are compatible with any processor, some low-end AMD video cards are able to work together with AMD’s integrated GPUs in Crossfire, delivering slightly better graphical performance. For more information, take a look at this guide on comparing AMD processors. If you are using budget AMD parts, this is worth looking into. For those who are wanting to use a dual GPU setup, it’s important to verify that the motherboard will support Crossfire (for dual AMD cards) or SLI (for dual NVIDIA cards). Keep in mind that in order to utilize SLI, you must have two identical NVIDIA cards. For Crossfire, you can use two different AMD cards as long as they’re in the same family. For example, you can use Crossfire with a HD 7970 and an HD 7950. It’s always a good idea to research compatibility issues before making a purchase. Finally, be sure your processor is powerful enough to keep up. A very weak CPU will not let a high-end GPU perform to its highest potential. This is known as bottlenecking. You can usually find out from others if your CPU and GPU combination will bottleneck by searching the internet with the model of your processor and video card. But even a mid-tier CPU should be powerful enough to let a top-tier GPU perform to the best of its abilities. In the end, AMD and NVIDIA both provide GPU solutions that will work well in practically any system. Careful planning and research is always key. Whether you plan on building a gaming powerhouse, a professional editing workstation, or a compute system, understanding your GPU options will help you decide which video card is right for you.